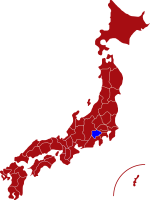 Yamanashi is located near the centre of Japan’s main island, Honshu and is famous, amongst other things, as the home of the iconic Fuji San. The prefecture is blessed with an abundance of natural beauty such as Mt. Fuji, Fuji Goko (Fuji Five Lakes) and the Shosenkyo Valley, which is famous for its stunning scenery and picturesque waterfall. By train it is only 90 minutes from Tokyo and two hours from Osaka, making it an ideal getaway to relax in any of the many wonderful onsens dotted around the prefecture and to enjoy the breath-taking scenery Yamanashi has to offer. 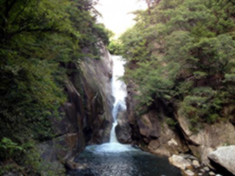 For more information about Yamanashi prefecture, see their official tourism website. Rail - The main station in Yamanashi is Kofu Station. There are regular trains from Shinjuku station in Tokyo and the journey time is just 90 minutes. Fuji Shibazukura Festival takes place at the foot of Mt. 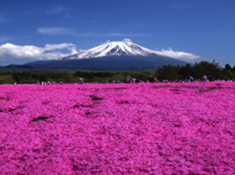 Fuji from around mid-April to the end of May and is one of the best locations in Japan to see shibazukura in bloom. Fuji Five Lakes are located at the base of Mt. 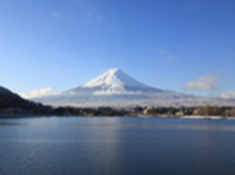 Fuji and create a stunning visual effect of Japan's most famous peak. Shosenkyo Gorge is officially designated as a "Special Place of Scenic Beauty" and located in one of Japan's most beautiful national parks. 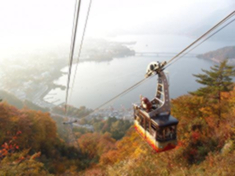 Kachi Kachi Ropeway - From the observation platform at the summit, visitors are treated to breathtaking panoramic views of Lake Kawaguchi and Mt. Fuji.